I know that most people (other than Popeye and me) don't like spinach but this is very tasty. The trick is to not overcook it as that's when spinach develops a bitter flavour. Steve is a self confessed "veggiephobe" and he gave this dish 11 out of 10 - high praise indeed! Heat the vegetable oil in a large pan and then add the fenugreek seeds and let them cook for a minute or so. Next add the chopped onion and let it cook until it is transparent. Add the green chilli, garlic and ginger and let it fry for a minute with the onion. Then add the salt, red chilli powder and turmeric and stir well. Add the chopped tomatoes, stir and let the tomatoes soften. Once the tomatoes are cooked add the spinach and mix well. Cover the pan and let it cook for a minute. Then take the lid off and let it cook on a low heat. The spinach is cooked when it still has a bite to it. 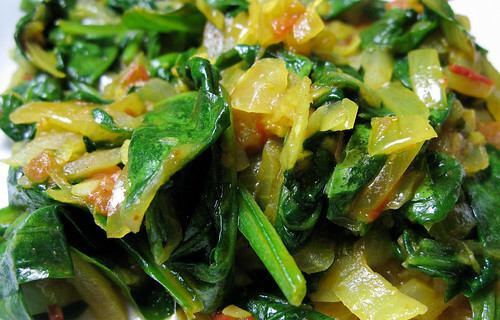 Actual cooking time varies depending on the size and freshness of the spinach leaves but should take no longer than 2 to 3 minutes. Serve immediately with fresh bread and a spoonful of yoghurt or raita. Going to try this. Now I'm back in charge of cooking in this household, any ideas for disguising cabbage and broccoli?? I just made a version of this on my blog! I made some changes but I loved it. I linked to your site! I'm going to try DOZENS off recipes off your blog now. thanks!